What to look for in a safer, more eco-friendly disposable diaper. None of the following environmentally conscious features eliminate the impact diapers have in landfills. They do decrease or remove common toxins used and are produced with safer manufacturing practices. All disposable diapers use a material call SAP, an absorbent gel that has been shown to be toxin-free, but not natural. Here are some of the things to look for when evaluating a disposable diaper for a safety and sustainability implications. Chlorine free – Diapers are often bleached white with chlorine, releasing the toxic carcinogen dioxin. Fragrance free – The ingredients “fragrances” and “perfumes” are unregulated and could mean many possible chemicals. Many artificial fragrances contain chemical irritants. Dye free – Dyes are also unregulated and can cause skin rashes. They are used for wetness indicators and colorful designs on many conventional diapers. Phalate free – Phalates are well known toxins found in many plastics, including the liners in many conventional diapers. Contain no lotions – Most lotions used in disposable diapers are used to protect skin but are petroleum based. 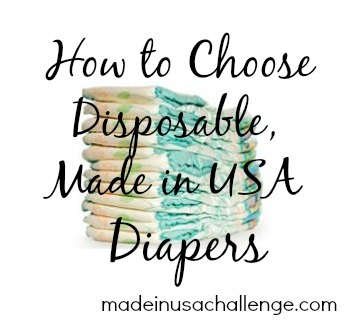 How to choose made in USA diapers for your baby. The purpose of this post is not to debate cloth versus disposable diapers. You can research the issues easily with an internet search. The issues with cloth diapers made in China has been explored thoughtfully by Kim of Dirty Diaper Laundry, who has also compiled a through list of cloth diapers made in USA and Canada. This is a great resource for those who choose the cloth diaper route. Most conventional disposable diapers are American made. These diapers are the easiest to find and are the least experience. However, conventional disposable diapers typically do not include any eco-friendly features and often contain the toxins listed above. Major brands of conventional disposable diapers that are made in USA include Huggies, Pampers, Luvs, up&up (Target store brand) and Cuties. Pamper’s Swaddlers “Sensitive” – Marketed as a healthier, more eco-friendly version of conventional Pampers. “Green” claims include the inclusion of aloe, hypoallergenic and “blanket like softness”. Contains chlorine, latex, fragrance, and dyes. Not compostable or biodegradable. Clearly a greenwashed product that does not seem superior to the conventional version. Huggie’s Pure and Natural – Labeled as “natural” and “with a touch of nature.” Made with a portion of organic cotton and liner made with some “renewable materials.” Contains chlorine and dyes. Not compostable or biodegradable. Mostly greenwashing, with some improvements to their conventional version. 7th Generation – Popular brand of green diaper. Fragrance free, chlorine free, no petroleum-based lotions, packaged with recycled materials. Contains sustainably harvested wood pulp fluff. Not biodegradable or compostable. A fairly green product, best option for a made in USA totally disposable diaper. G Diaper – Hybrid diaper consisting of a cotton pant with a disposable plastic-free insert. Contains harvested wood pulp. Cotton pant is reusable, insert is flushable (dirty diapers) and compostable (wet diapers). The best option for a green made in USA diaper that is partially disposable. Other green disposable diapers that are not made in USA: Nurtured by Nature (Mexico), Nature Babycare (Turkey), Babyganics (“imported”), Earth’s Best (Mexico), Honest Company (Mexico), Bamboo Nature (Denmark). For more on 7th Generation vs. G Diapers, check out this Sustainability Report by the University of Vermont. More on the use of SAP in disposable diapers from the G Diaper site. Sarah Mazzone is a writer, nurse and Mom from Philadelphia, PA. She founded Made in USA Challenge in April, 2011 to detail her mission to find goods made in USA and become a more conscious consumer. She actively seeks out items made in USA to help strengthen our economy, protect our environment, safe-guard families from toxic products and minimize exploitation of workers in developing countries. Follow Sarah’s journey on her blog, Made in USA Challenge, as well as on Facebook, Twitter and Pinterest. I would add Broody Chick to the non-made in USA list. They are made in Canada, and while I haven’t tried them because I CD, I did a lot of research prior to deciding to CD, and they seem to be one of the safest/most environmentally friendly disposables out there. They are actually compostable! Great article, I love the Made in the USA focus; it’s often overlooked but important. It’s great to look at the “where made” and not just the contents when shopping for the best choice for your family. Huggies also uses wood pulp, and I hope more companies start or find other options to decrease SAP. There’s so many more options and more to know that what’s just on the surface when looking for the “best” diaper for your baby. Thanks for the great resource for parents!